Q. Does anyone from Millennium’s side survive the events of this final battle? If so, what do they do afterward? A. Afraid not. This group was self-selected to be uninterested in redemption. Any who try to hide are tracked down by people like Seras, Saint Tail, and Chris Orcot. Q. Is Timothy still trans* in the Shineverse? Does he act on it in any way while head of Iscariot? Q. 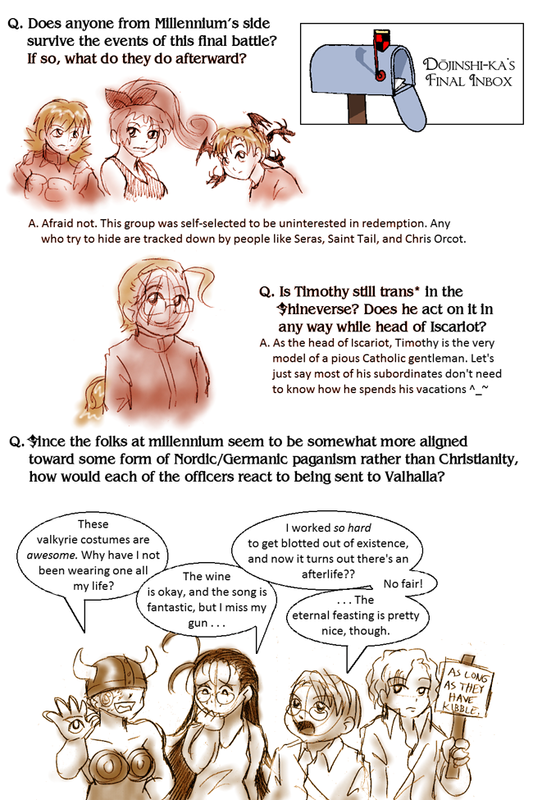 Since the folks at Millennium seem to be somewhat more aligned to ward some form of Nordic/Germanic paganism rather than Christianity, how would each of the officers react to being sent to Valhalla? Zorin: These Valkyrie costumes are awesome. Why have I not been wearing one all my life? Major: I worked so hard to get blotted out of existence, and now it turns out there’s an afterlife?? No fair! …The eternal feasting is pretty nice, though. Captain (sign): As long as they have kibble.